St. Peter’s Battery is a archaeological site dating back to the 1800s. The Dutch, in an effort to protect their land from conquering enemies constructed this fortress which once consisted of a protection wall, cannons, and a sleeping unit for off duty guards. It was specifically situated on the shores of the Great Bay at sea level in order to shoot cannons directly into an approaching enemy ship’s hulk. Pelican Peak is working closely with the local Buncamper family to restore these ruins so that we are able to offer visitors an in depth look into the rich history of Sint Maarten. Located in Philipsburg along the cruise ship terminal shores lays the remains of what was once St. Peter’s Battery. The battery was built in the eighteenth century and used as a defence against enemies from the entrance into Sint Maarten’s Great Bay. What makes this battery so unique is that it was not financed by the Netherlands but was instead built and paid for by the citizens of Sint Maarten themselves. After numerous requests for defense funds to the Dutch West India Company went unanswered the citizens of the island had no choice but to take matters into their own hands. Unrest was unfolding throughout the Caribbean as power and politics with Europe began heating up. Johannes Heyliger, Commander of Statia authorized council members of St. Maarten to begin negotiations with the Governor of the French Antilles in order to form a treaty which would ensure Sint Maarten’s neutral position in the event of a war between the Netherlands and France. The treaty was put into place on July 14th 1734 and stated that in the case of an attack the Dutch and French commanders would come to support each other if needed. The English Commanders of St. Kitts and Hague took the treaty as a snub against them, they began firing at and confiscating Dutch ships in a series of regular harassment. The English from Anguilla then attacked the Dutch side of the island claiming that they were looking for their French commander whom they thought was hiding on the island. They also began to demand Dutch land, looted, stole slaves and animals and threatened to kill the Dutch Commander, John Philips. John Philips reacted to the British hostility by strengthening Fort Amsterdam with a palisade and by setting up 2 other small batteries containing 3 cannons on the Dutch side of the island. The request for defence money continued to go unanswered leaving the citizens to pay for their own military efforts in addition to guarding the batteries themselves. John Philips wanted to continue with his military efforts by building a third battery at Babits Point near Oyster Pond. Unfortunately before he was able to do so he passed away. In 1746 Johannes Heyligerm, appointed his brother Abraham Heyliger to act as Philip’s successor. Under Heylinger’s command a new fortress was built near the eastern end of Great Bay now known as St. Peter’s Battery. Heylinger was able to get in contact with the Dutch West India company and requested 12 new cannons for the fortress, as well as 12 soldiers to help keep guard. 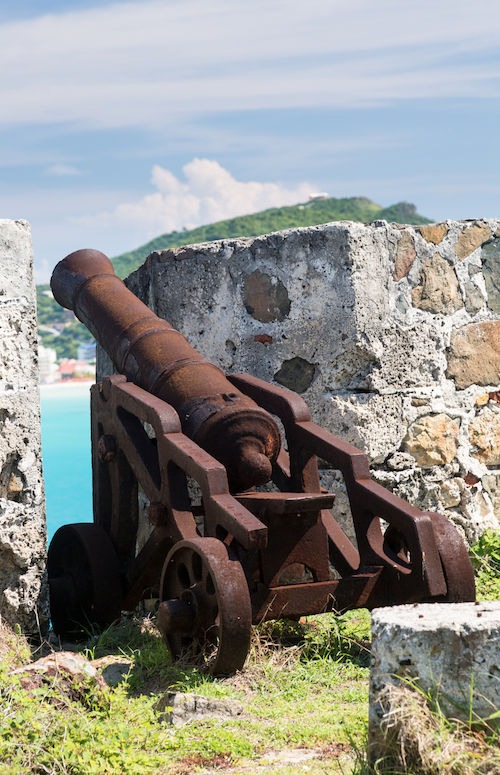 This new fortress was essential to the island’s protection, the capital Philipsburg was only guarded on its west side by Fort Amsterdam and the cannons could not fire far enough to prevent an enemy attack. Even though their requests for funding were not met by the government the citizens had no choice but to go forward and continue on without their assistance. The battery: a low wall or parapet with a platform for the cannons was eventually built on the shore at sea level. The cannons were able to fire very close to the level of the ocean and straight into the hulk of enemy ships. 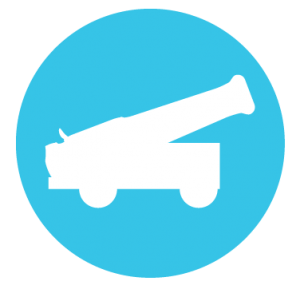 The battery used a straight wall without embrasures in order to achieve a wider firing range. A housing lodge was also built behind the wall for guards and volunteers. St. Peter’s Battery was never employed in any direct military action, however its strategic position has been widely acknowledged to have aided in the islands defense over the decades to come. Sign-up for our newsletters to receive regular updates and exclusive offers for Pelican Peak! Pelican Peak is a series of unique eco-adventure attractions perfectly situated just steps from the Port of St. Maarten. We invite you to come have some fun while taking in the island’s most breathtaking views.